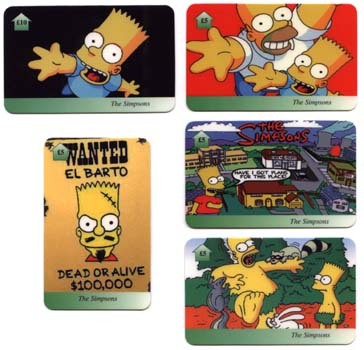 This set of 5 Simpsons phone cards comes from England. 4 of them have a face value of ¢G5, and 1 has a face value of ¢G10. (The ¢G10. card is the one in the upper left corner.) All cards are USED but worth to be included in your collection as they are no longer released..